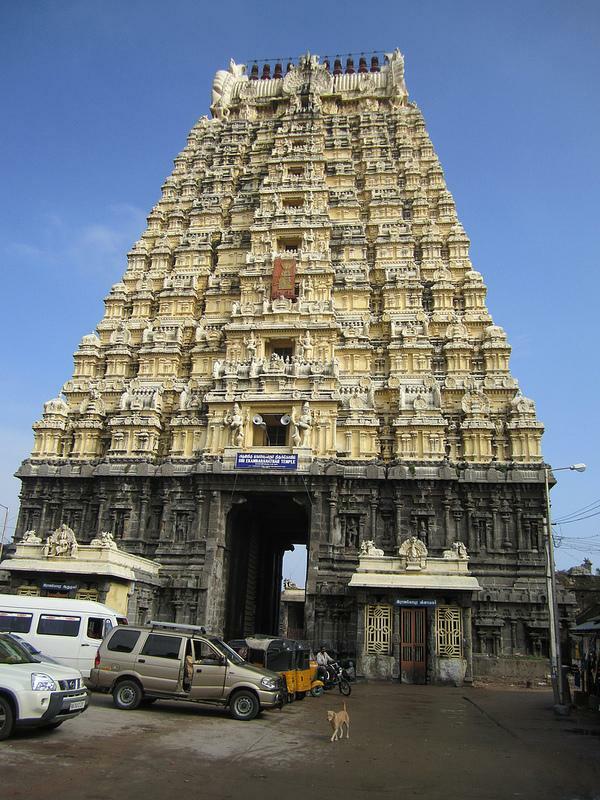 The temple is located on the northern part of Kanchipuram. Amidst of 23 acres of land, with tallest tower of 59 m high, the temple is termed as one of the tallest tower in India. In this temple Lord Shiva is worshipped in the form of “Earth”. Thus the temple is one of the “Panchabhootha Sthalam” (Five nature elements, namely Earth, Water, Air, Sky, and Fire). There are two versions of mythologies regarding the temple. One says that while Lord Shiva was busily creating, destroying and obstructing the lives in Universe, Goddess Parvati closed his eyes which made the Universe to come to standstill. Due to this serious mistake, Lord Shiva cursed her to be born on Earth. Then Parvati framed a Shiv Ling out of Mud (Earth) on the banks of Kampa River and meditated. She overcame all obstacles caused by Lord Shiva with the help of Lord Vishnu. Later impressed by her act, Lord Shiva married her in the meditating spot. However, the second version goes like, Goddess Parvati was cursed with ugly face by Lord Shiva over a fight and she came down to earth and meditated under Mango Tree on Kampa River. Later Lord Shiva was moved by her gesture and bestowed her with beautiful face. Tourists can see this mango tree on the Parkara of the temple. Also four branches of this tree represent four Vedas. People here say that the mangoes on these four branches have four different tastes. The temple was built by typical Dravidian style of architecture by Cholas and later renovated by Vijayanagar Emperor. Yantra or Chakra Peetam which represents the Goddess is placed in front of the Deity unlike the rest of temple where the Yantra is placed in basement of Deity.